Forums » General Discussion » The Water Cooler » Headphones reccomendation? #360617 - 12/10/11 08:20 PM Headphones reccomendation? I'd like to get my dad some headphones for Christmas. He needs the full size over the ear type to use in the computer when he can't blast his new Bose speakers (yeah I know). I'd like to keep the price around $60 or so. Any suggestions? 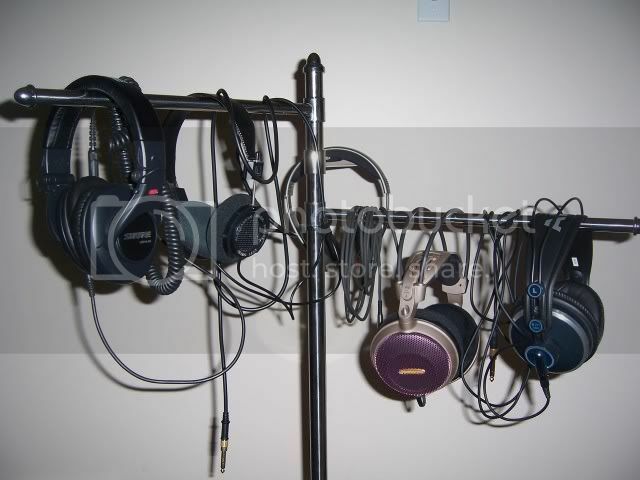 Spend about $15 bucks more and swing for the Shure 440 pictured on the far left. Places like Amazon usually have the cheapest prices. It's not perfect, but there really isn't any "perfect" headphones in this price range. It's a really good sounding headphone though and a great introduction to good sound. It's closed so it does a decent job at blocking outside noise as well. If your dad is used to Bose, he will find these to be very detailed in comparison, with nice punchy and snappy bass. They are very clean sounding throughout the midrange. The biggest con is the clamping force that you can experience on the head, it lessens over time. They are also low impedance and it stays fairly constant, with no major swings in impedance. They are just fine driven by portable devices and plugged straight into your computer. Not having to worry too much about the output impedance of the source the headphones are plugged into. You can read a plethora of reviews on Amazon (both the good and the bad). Thanks, I knew you would respond with good advice. On that clamping thing, do you wear glasses? I've found my AKG DJ41s unuseable because of the clamping thing over the glasses. I LOVE my Shure 840s. Despite the size, I prefer to take them on travel w/ me because of the complete sound isolation (seems to drown my kids just fine...) and comfort. The 440's are sure to be a good, younger brother. Hmmmm.. Good point ken. My dad does wear glasses I wonder if that is a deal breaker? Comfort is a possible issue with any headphone and user dependent. When I was talking about clamping, it wasn't pressure around the ears but a feeling of pressure on the head. It lessens over time with use or you can extend the headband more, and wear them a bit loose which all but eliminates it. Another good idea is find something they can fit on in the first couple of weeks when your not using them so it speeds up the break in process on the comfort. There are also 2 different pad options you can buy for the 440. The Shure 840 pads which are bigger and more comfortable and the Shure 940 velour pads with are lush. I'd like to get myself a pair in the future.